Set above the beautiful Río Sil, in the heart of the Bierzo wine region, Ponferrada is famed for its storybook castle, built by the Knights Templar in the 13th century. Located about an hour and a half west of historic León, on the Camino de Santiago (St James Pilgrimage, whose final destination is the beautiful Galician city of Santiago de Compostela), this laid-back small town with Ancient Roman origins is a wonderful place for enjoying relaxing wine and tapas in the atmospheric historic center. A visit to Ponferrada begins in the old quarter of the city, where the 16th-century town hall lords over the Plaza del Ayuntamiento. Just beside it stands one of the symbols of Ponferrada: the Torre de Reloj (clock tower). Begun in the mid-16th century and built atop one of the city’s medieval gates, the striking tower serves as the gateway to the narrow, oftentimes steep streets of the historic center. Among the “vinotecas” (wine bars), taverns, and traditional shops dotted along typical streets like the busy Calle del Rañadero are a few can’t-miss monuments, like the Basílica de la Encina, on the plaza of the same name, or the 16th-century Real Cárcel (Royal Jail). The “Cárcel” is now home to the interesting Museo del Bierzo, a museum dedicated to the history of Ponferrada and the region of Bierzo. No visit to Ponferrada is complete without a glimpse of the Castillo del Temple, the castle-fortress-monastic complex built by the Knights Templar. Seen at night, it is extraordinary. With its strong towers and imposing yet solitary air, the castle is far and away the most memorable of the city sights and is open for visits. Beyond Ponferrada itself, you can explore natural wonders like the Médulas, a ruddy-red mountain burrowed through with tunnels dug by the Romans, who mined this area for gold. It’s now a UNESCO world heritage site and, at only 20 minutes drive from Ponferrada, is an ideal destination for walking and hiking. There is an annual medieval festival in Ponferrada called “La Noche Templaria” (Templar night) that takes place on the first full moon in July and features a medieval fair and festivities. Ponferrada’s taverns and restaurants offer a broad range of Spanish specialties, but the focus is on traditional Castilian fare. 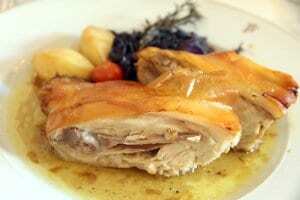 That means lots of pork dishes, hearty stews, flavorful sausages, and rich sheep cheese. Try cochinillo (roast suckling pig), Sopa de Ajo (garlic soup), or cocido (a chickpea and pork stew). Pair the food with the delicious wines of Bierzo. Although best-known for its exciting developments in Mencía wines, Bierzo also produces limited quantities of red grape varieties like Garnacha Tintorera, Merlot, Cabernet Sauvignon and Tempranillo; and the white grape varieties Godello, Doña Blanca, Malvasía and Palomino, the grape best-known for its use in Jerez’s sherry wines. The most popular Bierzo wines, however, are still Mencías. Top cellars include Dominio de Tares and Alvaro Palacios´ Petalos. The very best combine punchy flavor, balanced tannins, and smooth fruity notes into fantastically enjoyable wines that combine well with the varied cuisine of the area. A 16th-century clock tower that was added to in later centuries, this is a symbol of historic Ponferrada. An exterior stone staircase on the Calle Carnicerías leads up to the tower itself, while an archway dubbed the “Arco de las Eras” allows pedestrians to walk under the tower and into the historic center of the city. A lovely basilica tucked into the heart of the old city center. Beginning with the area’s Paleolithic history and spanning historical and societal highlights leading up to modern times, this small museum inside the 16th-century Royal Jail includes art and artifacts about the town and region surrounding it. Home to the Radio Museum, a curious collection of antique radio memorabilia, this stone house with touches of late Baroque design makes an interesting visit.